Are fans flocking to the second season of the Ozark TV show on Netflix? As we all know, the Nielsen ratings typically play a big role in determining whether a TV shows like Ozark is cancelled or renewed for season three. Netflix and other streaming platforms, however, collect their own data. If you’ve been watching this TV series, we’d love to know how you feel about the Ozark season two episodes. We invite you to rate them for us. **Status update below. A Netflix crime thriller, Ozark stars Jason Bateman, Laura Linney, Sofia Hublitz, Skylar Gaertner, Jordana Spiro, Jason Butler Harner, Esai Morales, Peter Mullan, Lisa Emery, Julia Garner, and Janet McTeer. The story centers on Marty Byrde (Bateman), a Chicago financial advisor who, along with his family, becomes entangled with a dangerous drug cartel. What do you think? 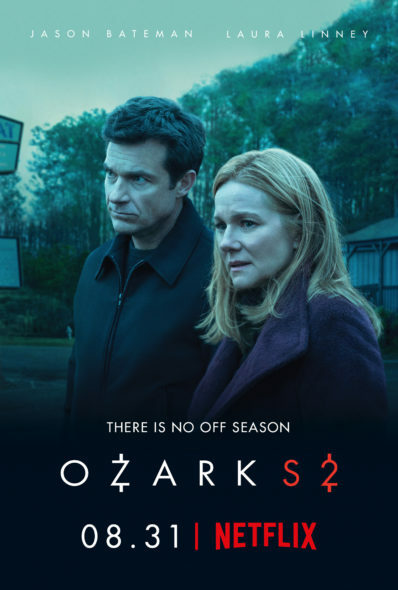 Which season two episodes of the Ozark TV series do you rate as wonderful, terrible, or somewhere between? Should Netflix have cancelled or renewed Ozark for a third season? Don’t forget to vote, and share your thoughts, below. **10/10/2018 Status Update: Ozark has been renewed for season three on Netflix. Details here. More about: Ozark, Ozark: canceled or renewed? Love it. Better than Breaking Bad, didn’t think that was possible. Can’t wait till season 3. I have binged watched 1 & 2 four times! Addicted to this show. I have binged watched both series 4 times and got 5 other couples to watch. Cannot wait till season 3. It is better than Breaking Bad. Didn’t think that was possible. I’ve been delaying watching the last episode of season 2 because it makes me sad to think we have to wait several months for season 3. So I’m going to watch it today and then just start all over with season 1 episode 1. This is a very good series with awesome acting. I agree with Dr. Mack that the lighting could be better. This series is compelling with adequate script writing and a good cast that moves the narrative along. The two main characters played by Jason Bateman and Laura Linney are well-written, and they carry an improbable, but catchy, storyline quite well. However, I have one major criticism of the series: it is filmed/photographed with inadequate lighting. That’s right, the sets are so dark that it’s difficult to see the characters and scenery at times. Nevertheless, it’s still very watchable. I hope the production team addresses this very uncomfortable situation in the making of season 3. Fantastic series. Can’t wait for Season 3! We want more seasons. Great cast, along with fantastic story really made this series special. I am telling every one that I know to watch it. I am very much looking forward to more of this amazing series. Thank you. Great great show! Acting is wonderful everyone especially Jason Batemsn especially. There has to be a third and more seasons. Great series! I just wish they wouldn’t drop a whole season at once because it’s so addictive, I binge the whole thing in a day or 2. Cast, writing, directing, everything is great. I know what you mean about wanting more, but I think that keeping a lower number helps with the quality and keeps us wanting more. This show is just amazing . As always Jason Bateman doesn’t disappoint. All of the actors in this show are pretty incredible. The story line is just insane! This poor guy is just trying to keep him and his family alive and he gets in deeper and deeper. I watched Season 2 in a few days. Now I have to wait for SEASON 3. one of the best shows out there!